Anyone need a used Amp Gauge? Came with an instrument cluster I converted to Volts. Have no way of testing it...unless someone can advise a method to bench test. $30 + shipping. o Wire should be 12ga (I used red and black to denote + and -, color really doesn't matter). o The load must be something of a known amp value less than 40 amps, such as a fan that is rated at a 5 amp draw so you know if the gauge reads correctly. o The switch must be rated for the expected load. Using a typical household AC switch would be safe and easy. Not to step on anyones toes but...........You will smoke it in short order testing it that way. 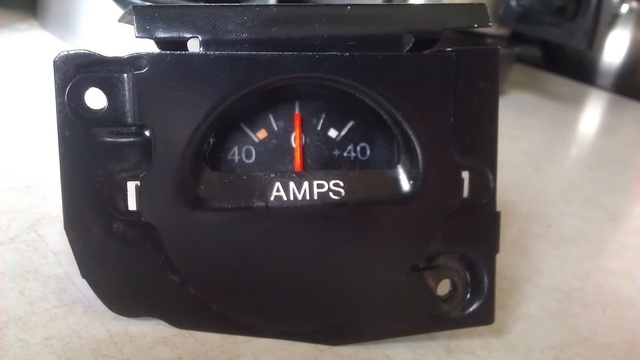 It's not really an amp meter. It reads the voltage difference between the horn relay junction point and the end of the pos batt cable at the starter solenoid. In other words, say you have 12.8V @ the starter and 13.2V @ the horn relay it will show a positive charge. Say you have the engine off, lights on, 12.5V @ the starter & 12.1V at the horn relay it will show negative. Ever notice the cars equipped with the amp meter have an extra smaller wire at the starter solenoid positive stud? this goes to the amp meter. These cars are not like the mopars that ran full load through the amp meter. There is no way the ribbon circuit would handle 40 amps. Its calibrated with the size & length of wire to get a estimate of the amperage. You can test it by touching the leads to a AA battery, switch +/- it will read the opposite. A 9V battery will peg it. It is wise to splice a small 5 amp fuse in line with this to protect the ribbon circuit. Just tried it with the AA battery and sure enough...it jumped both directions when I switched +/- leads. Thanks for the info! Your welcome. Think of it as a 0~3 volt meter. Those type ammeters are designed to measure voltage across a shunt, and not the actual amp flow across the meter itself. Testing was easy wasn't it !! 73ss wrote: Not to step on anyones toes but...........You will smoke it in short order testing it that way. It's not really an amp meter. It reads the voltage difference between the horn relay junction point and the end of the pos batt cable at the starter solenoid. In other words, say you have 12.8V @ the starter and 13.2V @ the horn relay it will show a positive charge. Say you have the engine off, lights on, 12.5V @ the starter & 12.1V at the horn relay it will show negative. Ever notice the cars equipped with the amp meter have an extra smaller wire at the starter solenoid positive stud? this goes to the amp meter. These cars are not like the mopars that ran full load through the amp meter. There is no way the ribbon circuit would handle 40 amps. Its calibrated with the size & length of wire to get a estimate of the amperage. Interesting...I stand corrected. I never dealt with a factory unit, only aftermarket amp gauges that do run the full load. I just *assumed* that it worked the same.